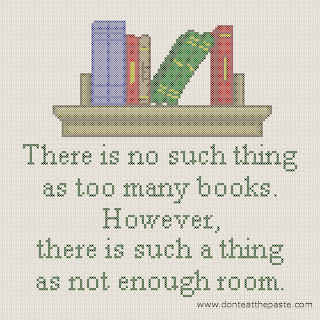 "There is no such thing as too many books. However, there is such a thing as not enough room"
William said that one day when I was talking about going out book shopping. My husband said "Don't you have them all?" And I said "NO! 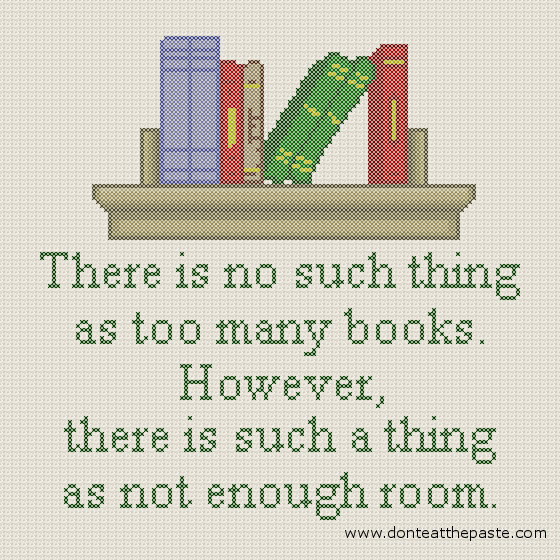 and there is no such thing as too many books!" I told my son it should be a cross stitch pattern. So it is! I based it off an old pixel bookshelf that I made years ago. Click on the image for a larger version. Print to fit page. It's 140x140- so 10x10 inches in 14 count. I love this! My daughter is an avid book reader/collector and this will be going on her wall. Thank you! I saw this image shared on facebook recently and immediately said "I need to actually have that stitched." I did head to, as far as I could tell, the first page that shared the image and posted a link to the blog here! Ummm, is there a color code for this?? Is there a color code for this chart?